Summer is in full swing and now is the perfect time to reclaim the family goodness. As a parent, I find myself becoming a little more present with my kids during the summer time. It feels a little more free and open to do all the things pushed aside during the school year. Here are a few ideas for bringing your family together this season. Get down with nature. A recent frog festival at a local community center in town had us all totally intrigued and we decided we must go. We left with 10 tadpoles and lots of excitement. Everyone had a job to take care of the little guys and watching them change into frogs brought so many interesting conversations. Butterfly gardens and kits are another great at home family project to get close to nature. The most awesome part is that it was short and sweet, no long term pet care. Make meals together. With all the yummy fresh fruits and veggies of the summer, it is a perfect time to cook. Making meal time a family affair from start to finish brings you all together on lots of levels. Kids will be more invested in trying new dishes and the skill fosters independence for future self care. Try picking one recipe to perfect. Josiah, Lucy and I are out to find the best guacamole recipe. Between chopping and mashing, all ages are into making this dish. Dive into art. Butcher paper over the dining room table and some crayons can be a simple way to start your family art hour. Instead of quiet time in the afternoon, we are opting for a watercolor hour. Change it up offering a different medium every week. Think process and not product with this family activity. Try to do it in a place where you aren't so concerned about potential mess and clean up. It will be lovely fun. Get your clean on. If your kids are like mine, the house is a lot messier in the summer. More time at home means various projects in stages all over, more dishes, and more laundry. No one really wants to clean up individually but everyone is more willing if we do it together. We love to play family DJ at our house to get the ball rolling. Each person picks a song and then we clean until all the songs run out. Sometimes we end with the Cha-cha slide to gather back together. If you have a little family you can always pick more than one song. It's a super fun way to get it all done. Do something kind and adventurous. Our family is in love with a pastime we call Ding-Dong-Ditchin'. We leave something kind on a doorstep of a friend or someone we don't know, ring the doorbell and run. It is more fun than you can imagine. You can see my kids in action here. Kindness has a way of bringing us together in a really awesome way. What are your favorite family activities in the summer? Spread the idea love in the comment section. Summer is upon us here in Washington D.C. I seem surprised every single year when the thermostat reaches 90 degrees and I'm not sure why. Take your walk early in the day. It may be humid when you wake up but humid and 75 is much better than humid and 90. Get out of the house as quickly as possible after breakfast and head to the park or take a walk through the neighborhood. It will wake you up for the day and take the edge off of the kid's energy before it gets too hot to do anything else. Explore to your heart's content. Do a cool art project. Lay out a piece of butcher paper on the ground in the driveway or out back and let the kids finger (or arm or foot) paint to their heart's content. When you are all done with your masterpiece, give everyone a chance under the hose. Even better, give everyone a chance to hose each OTHER off. This always results in a ridiculous amount of laughter in our house. Take time out for an energizing snack. Frozen grapes or blueberries are such a treat when the weather is so hot that you feel like you can barely breathe. You can try this Gooey Tasty Dip Stuff if you want a little extra pick-me-up. Put your kids in charge of the garden. Ethan and Nathan are out every evening when it has cooled down a little, helping to weed the vegetable beds and to pick the raspberries that have already arrived. Kids can learn about healthy fruits and vegetables, the importance of using organic practices to keep our food safe and how to be conscious of our water usage. I have Ethan working on a drip irrigation system as we speak, and I swear we will figure it out by the end of summer. Go catch a movie. Movie expert Sandie Angulo Chen offers some tips for surviving summer movie mania. There are lots of options this summer. Check out free family movies showing all summer long or check in your area for outdoor movies playing for free in your town. Let's hear your ideas for things for kids to do to survive the summer heat. I watched them as they surged ahead down the row, picking as fast as they could. Someone had deserted The Baby just behind me and I turned around to see him eating a green strawberry. I tried to point out the red ones, but he didn't really care. I know that the stems of strawberries are bad for you and I'm guessing the green strawberries aren't at the top of the great list. I thought about googling on my phone to see if they were poisonous but then I got caught up again in picking. I heard a shout from down the aisle and I looked up to see boys with half-filled pails and a dad making great progress. This was odd since I looked down in my pail and I had only managed to find eight berries. It was at that exact moment that I realized what I was missing. I turned to check on The Baby and he had a stem hanging out of his mouth. I snatched it out, promised to return and then ran down the aisle. I looked into the pails. My fears were realized. There were three pails full of strawberries with green tips. I looked at my husband with a glare and he blinked back a "whaaah?" I asked how they tasted. He said they were just okay. I mentioned that perhaps the ones that were ripe were better. He laughed. I did what any self-respecting mother would do. I played the Mother's Day card. K: Why don't you guys go play in those wagons over there while I pick? And can someone dig the green strawberries out of The Baby's mouth? I'll admit I was a little worried about all the green-tipped strawberries because I was fairly certain that this was the field that charged $5 a pound of strawberries and that is a LOT of money for unripe strawberries. I said nothing to the offenders but everyone wandered off to play while I worked. The weather was a gorgeous 60 degrees with sunny skies and I looked over to see Derek pulling all three boys in a wagon at the edge of the field. They were laughing excitedly and before long I had a fair amount of strawberries in my pail. I took them up to pay and realized with relief that they were $1.90 a pound instead of the $5 I feared. I was glad I had decided to embrace the moment instead of giving a lecture about following rules and listening to your mother on Mother's Day. And those strawberries? They will make great sorbet tomorrow. We are getting closer and closer to our Great Day of Gratitude on May 5th! Now that the gratitude train is going, what a great opportunity to explore being grateful with our kids in other areas of our lives. Here are a few things we are trying on at the moment to learn more at our house. The Gratitude Growl and Howl What is the one thing you are going a little crazy for these days? It's easy to be thankful for the things that make us really happy or even just stuff we enjoy. Go around the circle and give a growl, a howl and then state what you are grateful for. Being silly as a parent sometimes unlocks the joy inside and invites kids to share (or laugh at you). We are grateful growling for wildflowers, berries, Pokemon cards, the computer and puppy dogs at our house. The Manners Police Start young, before kids can even talk with please and thank you. Introducing the practice and gentle reminders send us back to the value we want to honor and instill. This helps us learn to be intentional in our thanks. The Gratitude Tree Head out for a nature walk to search for a medium size branch with lots of tiny branches. Buy a simple clay or ceramic pot you can decorate or paint together. Use plaster of Paris or marbles/rocks to hold your "tree" in place. Every season decorate your tree with the things you are currently grateful for written on tiny paper leaves. In the winter, you can hang ornaments or colored balls with the words written on instead. Just like the seasons, life is cyclical, the leaves are bursting and other times the tree is bare. This is a good activity to mix creativity and revive the focus every now and then. Quiet Thanks Doing acts that express gratitude anonymously can help kids discover that we can express our gratitude without the need for a return. Leaving flowers on doorsteps or writing a notes and hiding them for those we are thankful for to find can be really fun and kind of sneaky. Some children might prefer this way of being grateful. Leaving Space for Need Usually when we have a hard time being grateful it is because we are in need of something ourselves. Kids (and parents) might need the space to express needs and invite help or empathy which in turn produces a new and different kind of gratitude. What ways do you celebrate gratitude at your house? What has or hasn't worked for your family? Do share in the comments. Yesterday the final snow cleared on the front lawn and the yard was humming with sounds of new life as the birds set up house in the eaves and the crocuses pushed through the now visible flowerbeds. Spring is upon us and there's no better time to turn a corner on some better habits for the whole family. Clean, clean, clean. There's something about better weather that makes you want to get things in order and make a fresh start. Even the messiest among us here are making a concerted effort to clean up and I was downright shocked when one of my kids announced it was time for a total room overhaul. Use the energy of the fresh new season to make a point about the happiness that ensues when things are in order. Say no to screens. After a winter of being hunkered down in the media cave, sunny hints of spring ahead are the perfect push to get the screens to dim. I've noticed my kids are naturally more happy to play outside and if they do want to play video games right now, they are opting for the more celebratory round of Guitar Hero than the more strategic games they prefer to play in winter. Put your foot down and say this will be the spring and summer of less screens, more outdoor fun. Get out the bikes. Our bikes have been piled up in a heap in the garage all winter, but yesterday no one asked when the temperatures hit low 60's. I looked out from the kitchen window and every single thing with wheels that ever lived in the garage was in motion. The neighborhood kids rode in circles on our driveway and all I could see was weeks of happy bicycle bliss ahead. Better to start as early in the good weather as possible! Start planning for summer. If your kids are school aged like mine, there's no reason why they can't be included in the plans for summer fun. Have a family meeting and solicit ideas. Where do we want to go? What new thing do we want to try? What skill is this the summer to master? There's nothing worse than hauling your kids off to activities and summer camps that they never wouldn't have picked if you've given them the choice, so get them in the act right now. Kids are wandering out back without jackets on, windows are being cracked open, the robins are hopping around in melted snow puddles and everyone is happy to see the beautiful signs of spring. Every season change welcomes a new start and I love to anticipate what will be new again and what we will carry over. Here are some ideas to get your spring groove on at your house. 1. 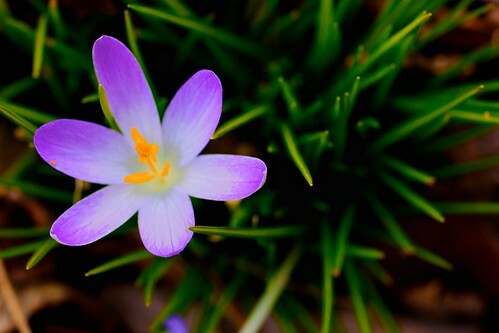 Go on a crocus hunt. We all went to walk the dog the other day when Lucy was beside herself with the tiny purple flower coming up out of the ground. She has now become obsessed spotting them and counting how many we can find on our walks around our neighborhood. The daffodils aren't far behind. Oh the magic of something beautiful growing! Don't have anything to grow yet? Why not plan your family garden together? Create a map and decide what and where you will grow your vegetables. 2. Get your family fitness on. Break out the bikes, dust off the trampoline, take a walk. Now is the time to return to outside games of chase and hide and seek. Your kids will be delirious if you suggest it and play with them. Try turning off the TV for a week and see if you find yourself outside breathing in the fresh spring air. 3. Get Juicin'. I don't know about you but oranges are piled to the ceiling at my grocery store. Why not let the kids help you squeeze some fresh juice to remind you of warm days ahead. You could get super crazy and try making a smoothie together? It wont be long before lots of fresh fruits and veggies will be ready for us to pick. 4. Do some Ding Dong Ditchin'. My kids and I are headed out to do some anonymous kindness today. Our local grocery store has daffodils for super cheap so we'll be making tiny bunches, attaching a note and then leaving them on random door steps. It's super fun and a great way to get out for an adventure. 5. Make an Earth Day plan. What are you going to do this Earth Day to celebrate and care for our earth? Get a big sheet of paper and brainstorm together on what you might like to do together. Google your city and Earth Day to see what is planned locally or come up with your own project. What are you doing to welcome Spring? Do you have any special family rituals or traditions when certain seasons begin? What do your kids love about this season? Let us know in the comments. For years we had two giant shelves loaded with art supplies in the boys bedroom. Quite often I would hear them digging around, looking for just the right recycled box to paint and become some new part of a very elaborate Lego world. It was organized and seemed to work fine, aside from the occasional mess, but a visit to a creative friend's house made me consider taking it all a step further. She turned a small sun room into a children's art studio and it was pure magic. My kids were delirious visiting her house and it seemed to ignite a new level of creating love. One weekend later I convinced my husband to give up a barely used sunroom/office to create our own family art studio. There is just something about claiming some territory and honoring creativity in the place where you live and spend so much of your time. The kids have spent hours upon hours since holed up in the little room, creating to their hearts content. Even the baby will want to participate. It helps to surrender to artsy mess and just let them get messy and into everything. We keep the any toxic or tiny supplies high and in tight containers, but markers, crayons and the like are fair game. Lyra constantly has marker all over her but she is happy. Use what you already have. Dig through junk drawers and recycle bins. You probably already have most of the supplies you need. It is just a matter of organizing it and laying it out in an accessible and inviting way. If this isn't your strong suit, invite and super clean neat freaky friend over, she'll know exactly what to do. Don't be afraid of getting rid of old stuff to make the clearing for the new space either. Think about why and how you use your current living spaces. Are they being utilized? Is a guest room really necessary? Can a space be shared if you really can't give it entirely over? Add some love to your space. Hang your children's own framed art work in the space. Put up shelves for sculptures and pottery. Don't forget to add photographs that remind you of beauty and family love. Music is a must have! My son Josiah made the art shown above after we were all sitting in the studio working on our own projects and listening to Yellow Submarine by The Beatles. We sometimes play family DJ and everyone picks a song to add to the playlist. All of it invites togetherness and creativity. Do you have a small carved out for your art or work? What tips do you have for encouraging art in your home? Tell us in the comments. Valentine's day has always been one of my favorite holidays. Ever since I can remember my mom made a heart`shaped meatloaf and decorated the table with hearts galore. My dad would bring home flowers and chocolates for me and my sisters and we all exchanged valentines after dinner. It never occurred to me that the holiday was soley for partners, I just thought it was about love of all kinds. This turned out to be a social life saver through awkward middle school years and other times when I was on my own. It was a great parenting move on the part of my parents. I always felt connected and loved. Here are a few ideas if you want to take back Valentine's back at your house. 1. Make a family love celebration plan. Ask the kids what kind of love party you should have. One year we decided we should eat everything we love. Every person picked something for the menu. It was hilarious. We ended up eating corn dogs, corn, ham croquetas, chocolate milk and cheesecake. I'll never forget that year. 2. Make a toast. Buying sparkling juice and start a new tradition. Have each family member make a toast to something or someone they love. Do it right and serve it in real or tiny plastic champagne/wine glasses. It makes it festive and fun. 3.Invite some friends. Invite someone different to your family love dinner. Maybe a single friend or an elderly neighbor, or even another family. Have a valentine station set up so they can make their own on the spot. Hang brown lunch bags on the wall with everyone's name to serve as mailboxes. Put a kid in charge of delivering the bags after dinner. It's always nice to widen the circle of love. 4. Do something different. If none of this sounds like your speed, why not try something totally alternative? Check out this project for reminding the world we are all loveable. Kindness will be sure to make the day your best ever! 5. Don't give up. You don't have to totally give up your time with your partner/spouse either. Plan a night out before or after when the restaurant aren't packed and it is quieter. A valentine's breakfast is always nice too! You can have both with a little planning and intention. How do you make Valentine's Day special at your house? Tell us in the comments. What do you do when things go right? When major milestones are reached? When stubborn behaviors give way to great new habits? You could reward your kids, but that can get exhausting after awhile. You could use praise, but research shows that verbal rewards can sometimes end up not being particularly effective. Here are a handful of joyful alternates that will help you as a parent let your child see your relief, delight and pleasure in their very important process of growing up. Woohoo world! You'll have to test the waters and see if this is something your kids like or not. I learned this little form of celebration from a woman named Kirby who routinely opened windows and doors to shout to the world her happiness. Today Carter found his missing jacket and put it right back on the hook where it belonged. After an agonizing series of weeks where getting Carter to take responsibility for his clothes seemed like a herculean task, I felt a "Woohoo" was in order. I opened the back door and yelled for the whole neighborhood to hear, "Woohoo World! Carter put his jacket on the hook without being told!" Carter thought this was really funny and I felt great having a chance to put some volume to my relief that we are finally making progress in this area. Let me tell you a secret. My kids love it if I call them over for a little whisper in the ear. I use these occasions to tell them how relieved, happy, delighted I am to see a specific way they are learning and growing. It's not praise per se; just an honest account of how i genuinely feel when I see they are conquering their developmental tasks. Ending my whisper with a hug lets my kids know that I'm noticing all the ways they are becoming people who care about their family, friends and neighborhood. Total appreciation. Sometimes the nicest way to celebrate an accomplishment is with an old fashioned thank you note. Imagine what you would write if your kid was a co-worker who had really given that last project his best. When kids start to take responsibility for their schoolwork, possessions, living space or relationships, it's time to take notice. Make a list of the things that meant the most of you and close with a special thank you. Leave your gratitude note somewhere it can be discovered with joy. Party down. When things are going well, it's totally worth it to you as a parent to make sure your kids know. Too often we wait for the wheels to fall off the wagon before we communicate how important things are to us. Go out for pizza, eat ice cream together out of the carton--do whatever it takes to communicate to your kids that life (and learning!) are worth celebrating. These are just four ways to let your kids know that you notice all the ways they are learning, growing and engaging in the world. What else can we add to this list?